Order personal checks online featuring a wide variety of designs including house cats, purebreds, and kittens. Most styles are available in your choice of single or duplicate checks. 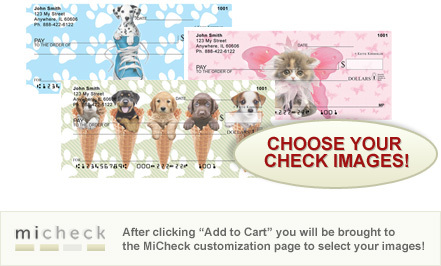 Checkbook covers are also available to match most of the cat check styles offered. DOGS and CATS have their own sections on the site; please use the category tabs at top of page to shop for household pets check designs. The kitty cats on these personal checks are chilling out! Click to take a look right now! These Cute Kittens Personal Checks show four adorable little kittens getting into all kinds of mischief. Support your local Humane Society and adopt a Cute Kitten! Do Yoga Right Meow Yoga Cats Personal Checks have four different check scenes of kittens practicing yoga with meditation poses. Choose from over 100 images to create your own unique set of checks of Keith Kimberlin's designs.